The schedule of the Royal Cremation Ceremony of His Majesty the Late King Bhumibol Adulyadej (Rama IX) of the Kingdom of Thailand on the Royal Crematorium at Sanam Luang, the Royal Turf. – The Royal Ceremony to make a merit on the occasion of the Royal Cremation Ceremony at Dusit Maha Prasat Throne Hall in the Grand Palace. – The Royal Ceremony to cremate the body of King Bhumibol Adulyadej on the Royal Crematorium at Sanam Luang, the Royal Turf. – The Royal Ceremony to keep the bone of King Bhumibol Adulyadej into the Royal Urn on the Royal Crematorium at Sanam Luang, the Royal turf. – The Royal Ceremony to make a merit dedicate for King Bhumibol Adulyadej at Dusit Maha Prasat Throne Hall in the Grand Palace. – The Royal Ceremony to make a merit for monks and install the Royal Urn that keep the bone of King Bhumibol Adulyadej to the 3rd floor of Chakri Maha Prasat Throne Hall in the Grand Palace. 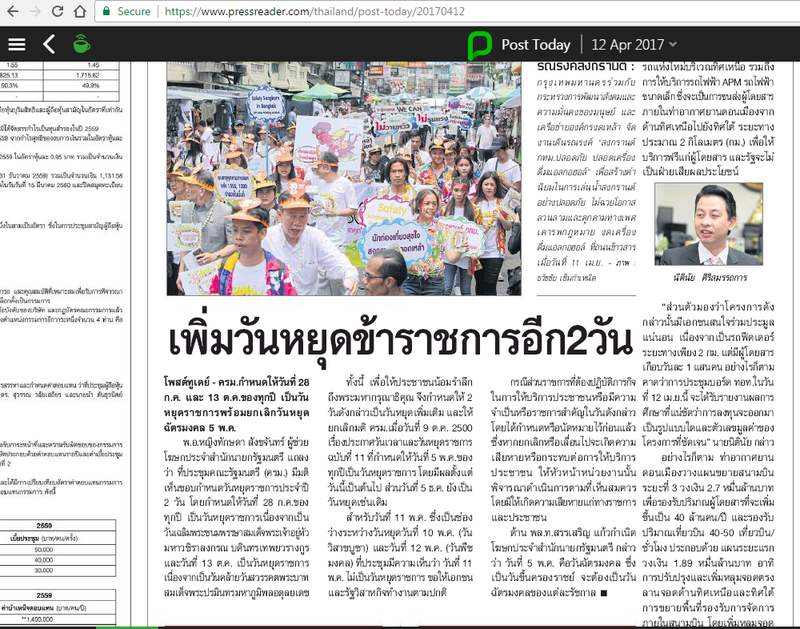 – เล็งหยุดยาวเพิ่มอีก 2 วัน 25 กับ 27 ต.ค. โพสต์ทูเดย์ – ครม.กำหนดให้วันที่ 28 ก.ค. และ 13 ต.ค.ของทุกปี เป็นวันหยุดราชการพร้อมยกเลิกวันหยุดฉัตรมงคล 5 พ.ค.